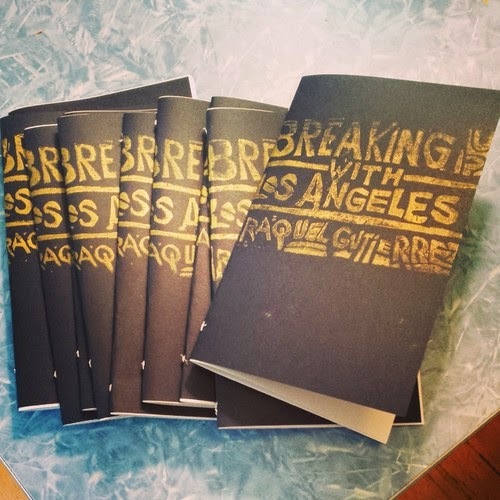 The latest chapbook that arrives in the mail is Raquel Gutiérrez’ Breaking Up with Los Angeles. ﻿﻿The large stenciled-looking title, all caps, is painted in opaque gold. On my copy, some of the initial letters appear partially cut-off. When I turn the book around, though, I see that the letters bleed onto the back cover. I wonder if this is intentional or if it is one of those lovely imperfections that comes with chapbook making. Anyone who has ever made chapbooks knows it can be highly laborious and at times painful. Fingers can get stapled or cut. The layout of the text can go berserk. Pages can accidentally get glued or inverted. Living space begins to look like a messy workshop full of scattered papeles and art supplies. Having moved from LA to the Bay Area a little over a year ago, Gutiérrez shares that her new chapbook Breaking Up With Los Angeles marks a “habitual haunting” of the city she broke up with. In her blog (http://raquelgutierrez.net/blog/) she writes: "This project is simply the receptacle for the ache...of leaving home...Poetry has always functioned as a site of no rules...A small holder of my psychic messes. A document. A textual object. Or an embrace for when all other embraces fail to keep me safe." It's a mantra that thematically echoes throughout the collection. Whether she's recalling a nightclub in Hollywood full of joteria and Naco Power, a sighting on Silverlake of a truck with "lavender colored testicles hanging so low," the haze of Sour Diesel, her mother's laughter welcoming her home, or the busquedad of her "Ole Dad" and herself in cantinas, Gutiérrez weaves in and out of the cityscape, gathering poetic fragments of the distant and recent past, re-membering/re-constructing that which has been lost or broken, all the while resisting nostalgia. But where one lives and loves, there are always those glimpses of nostalgia, no? In poem #7, Gutiérrez recalls a few of "the good things:"
Although this is her first chapbook, Gutiérrez isn't knew to the arts. 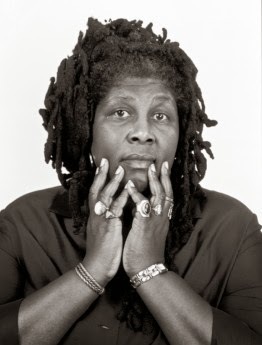 She has long been a performer, curator, playwright, and cultural activist. She was a co-founding member of the now retired performance ensemble, Butchlalis de Panochtitlan (BdP), a community-based and activist-minded group aimed at creating a visual vernacular around queer Latinidad in Los Angeles. Raquel also co-founded other Los Angeles-specific art projects: Tongues, A Project of VIVA and Epicentro Poetry project. Raquel's work has been published in The Portland Review and Ambientes: New Queer Latino Writing (edited by Lázaro Lima and Felice Picano). Poems are forthcoming in Sinister Wisdom and Huizache next year. Can you share a little about your current transition from performance to poetry? Are you still doing both? I like the insularity of writing poems. Performing relies on collaboration and a certain familiarity. Being in a new place, living away from Los Angeles, made me retract, reflect...I think I am done with the stage for now but when I read some of these poem aloud, there's a different rawness present that isn't so much about proving myself as an artist. I'm regenerating in a new way. When I was in El Paso, Texas all I did was write about Los Angeles. I found that the distance and desert allowed me to write about LA in ways that I may not have been able to do had I still been at home. Did you have a similar experience when moving to the Bay Area? When I was living in New York I couldn't write anything about L.A. The distance of course helps, but I don't know if being in a new city leads to being able to produce writing about L.A. I think a new place coupled with the ability to inhabit certain truths makes the writing come easier. What do you miss most about Los Angeles? I miss the 24-hour-ness of L.A. The thrift store near the old Sears. La Estrella's fish burritos. The 110 freeway tunnel from Chinatown into Figueroa. The sun coming up on Bandini Boulevard. Literary rockstars that you admire? Rubén Martinez, Wanda Coleman, Charles Bukowski, Roberto Bolaños, Helena María Viramontes, John Rechy, James Baldwin, Chris Kraus, Ali Liebegott, Salvador Plascencia. Are you taking on any new projects any time soon? I'm excited about a chapbook press endeavor I am taking on called ECONO TEXTUAL OBJECTS. 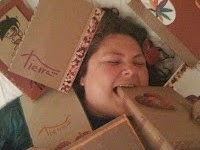 This [making chapbooks] was so much fun I don't want it to stop. I'm working on another chapbook for the Spring, along with chapbooks by friends and conspirators Félix Solano Vargas and Nikki Darling. These chapbooks are due out in May 2014. That's an interesting name for a press. What exactly does it mean? ECONO is inspired by one of favorite SoCal punk bands The Minutemen from San Pedro. They have the misfortune of having the same name as the xenophobic group in Arizona. But the punk band was founded by these dorky white guys into working class politics and aesthetic innovative approaches to making punk...like jazzy bass line and political poetry and experimentation that was accessible to a willing mass and within economic means. So I felt really connected to that and wanted to work with writers that are working full time, invoke that in the work and are making work that Is aesthetically adventurous. Econo being short for economic. Textual object feels more like what we're doing. Sure it's a chapbook essentially but I just felt the physicality of making a chapbook and how that translates to making physical art. The object. And its objectness is grounded in language. Are you addressing a particular need with the starting of ECONO press? The need. Hmm well I think it was a means to create a new kind of intimacy in the age of over sharing. I don't know but there's something intimate about knowing that only a specific number of people are experiencing the work. Can you share a little about the two authors whose work will be featured by ECONO this May? 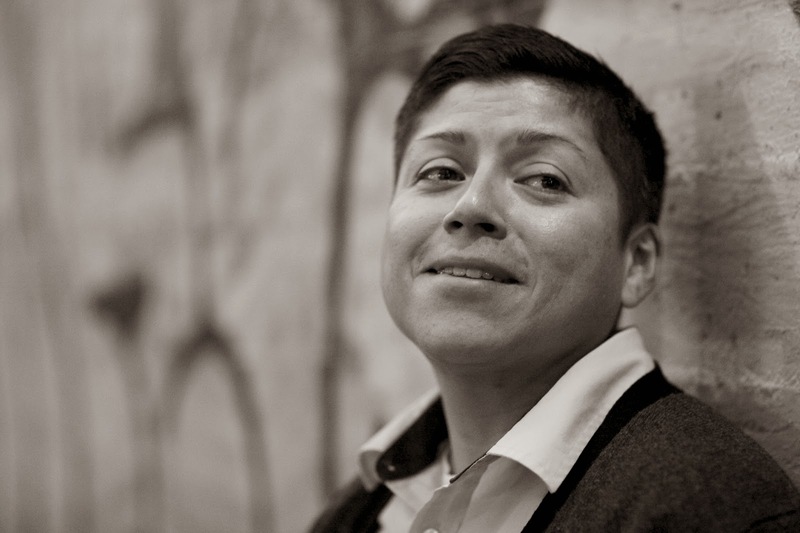 Félix is a young trans man community organizer who is writing about his family, trauma and survival. his work is also place based. He is writing about Riverside and labor. Nikki is the poet feminist pushing against form and patriarchal traces in language. She's an experimental writer but she's also been a nanny full time while she writes about art and her New Mexico roots by way of her mom. Her chapbook is called Pink Trumpet and the Purple Prose. In closing, even though you broke up with her, do you still love LA?